Boss Snowplow is expanding its product offerings with new accessories and machines. Its new Pre-Wet System, Pro-Lid and D-Force are now available as optional equipment. Further expanding the lineup, Boss now offers a line of walk-behind spreaders for smaller jobs and new plow options, like the skid-steer SK12 Box Plow and Tractor Plows. The Pre-Wet System activates the de-icing material to melt through snow and ice faster at low temperatures. It also reduces material bounce for improved material placement and efficiency. Equipped with a 60-gallon tank capacity, the Pre-Wet System is available as an accessory on all new VBX and Forge spreaders. 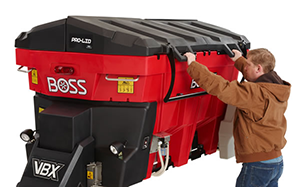 The Pro-Lid is a hard cover polyethylene system for BossVBX spreaders with an ergonomic, easy-open lid design that allows operators to remain on the ground while opening the cover doors. The Pro-Lid also has a secure weather seal to protect the de-icing material inside the spreader. The Pro-Lid is available as an option on VBX spreaders and can be retrofitted to existing Boss VBX Hopper Spreaders, with the exception of the VBX3000. The Boss D-Force is a down force system that allows truck plow operators to maintain a consistent hydraulic pressure through the use of a hydraulic accumulator for improved scraping performance. The D-Force is now an available option on select new straight-blade plow models including Super-Duty, Standard Duty and HTX Straight-Blade plows. To complement D-Force, Boss also now offers a Back Drag Edge as another new product option. It works with D-Force to improve scraping performance when backdragging. In addition to these equipment accessories, Boss also introduced two new walk-behind spreaders for ice control on sidewalks and smaller jobs. The stainless steel walk-behind spreader features a conical auger to minimize clumping of deicing material. With a 100-pound capacity, the stainless steel frame and hopper has enclosed metal gears and solid steel linkage for full gate control. This walk-behind spreader is also available with a 100-pound capacity poly hopper with the rugged stainless steel frame. All of the walk-behind spreader models feature adjustable front and side baffles for pattern control and can spread up to 100 pounds of deicing material, from partially assembled salt to ice melt and halite. The SK12 is a trip-edge box plow that features a self-adjusting hitch that allows the blade to adjust to any terrain. Expanding the equipment applications for plows, Boss now offers Tractor Plows in straight-blade and v-plow options for select John Deere and Kubota tractor models. A complete plow package includes blade crate, plow box, tractor undercarriage and control kit.